Today my plan is to get out and about without Jack man. I want to go shopping by myself. He hates being at the mall and hate being in the dressing room. I cannot really blame him. It is probably very boring and not very engaging. I am still feeling guilty about times when I am not with him. Last night I was even feeling guilty about all the time I spent making him food this week. At least once a day for the past 3 days I have made him some food. I totally have that “I have to do it all” mentality. I keep telling myself I can’t feel guilty for not playing with him because I am making dinner or making him baby food or cleaning up the kitchen or washing clothing! I am taking care of him by doing all of that. It is not like I am sitting around letting him cry while I just nap or ignore him. And I am not abusing him like that 21 year old “pot mom” Who spanked her 10 month old (I am entirely against spanking in any way, shape, or form, so this is especially upsetting to me) and blew marijuana smoke in this poor child’s mouth! This story had me near tears this week. Also, a warning, the spanking is on the video in the article so if you find that very upsetting I would skip watching it. I happened to see it on a news clip on the TV. So I try to take time each night, if I am feeling bad that he wanted to play all day and I had to get a few things done so he had to entertain himself, to remind myself that those things are making his quality of life better. He is also very all about momma. He always wants to be in my arms. Which can make getting things done a bit tough. I told Jason on Thursday night that I just needed a couple hours to myself to get out of the house for a breather. So I can get new fall clothing without having to sing songs while half dressed in the dressing room. My mom told me that this is perfectly normal. That it is GOOD for Jack and I to have some time apart. I am not a bad mom for wanting one afternoon to myself. I am still trying to convince myself of that. Last Sunday was so fun getting out with the girls. Jack lit up when I got home. That feeling was nice. He missed me and I missed him. I will keep that thought in mind today. I mentioned that I have been a baby food cooking machine the past few days. Here is my latest culinary masterpiece. I am not joking either. I considered snacking on his food last night after he went to bed. But I resisted since I ate a good deal of it while preparing it. mmmm they are so delicious and healthy! Baked Gala apples with cinnamon sprinkled on them! The recipe called for butter, but I omitted it. I have given him yogurt but I did not want to introduce butter at such an early age. He doesn’t need it. I don’t use butter a lot in my cooking, so there is no need for him to get accustomed to that in his food already. There is lots of time in life later for him to want butter! 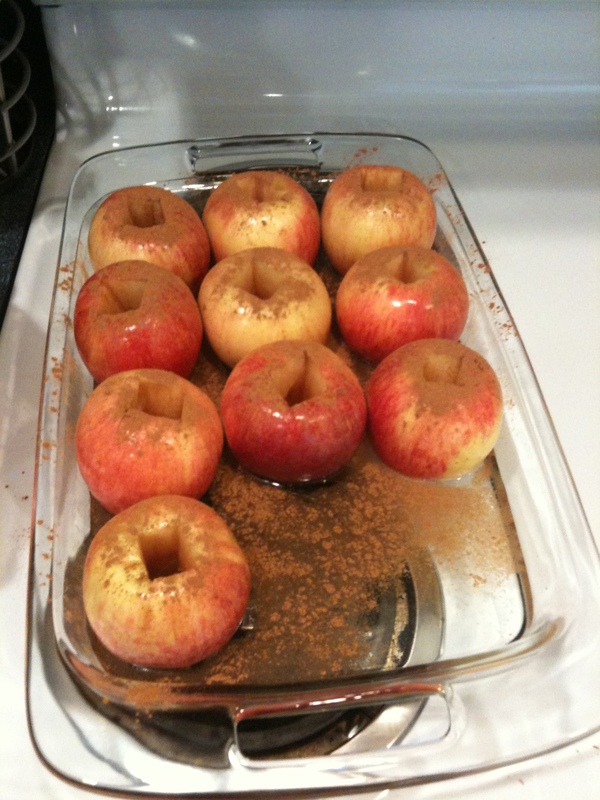 I cored the apples, placed them in the pan, filled it with a generous amount of water, and sprinkled with cinnamon. I then baked them at 400 for 40 minutes. I did include some of the skins when pureeing them. But I cut some off and snacked on the parts that were “scraps.” OH MY were they yummy! This kid eats like a king. I also finished off the extra applesauce. There was a nice amount left in the blender but not enough to fill up an entire freezer tray so I ate it. We also had a first yesterday. He was successful at eating finger food himself! I milled some cheerios into “dust” then sprinkled it on his sweet potato chunks. He was able to grab them and scoop them into his mouth. I was so proud of him. I couldn’t contain my excitement. I was calling people and chirping all about his awesome accomplishment. He was so excited to be able to do it too. It was like he was trying to eat popcorn! I videoed it, so no pics sorry! But he did awesome and I am so proud of my big guy! He is developing so well! Do you have “guilt” about momma things? How do you remind yourself that you are doing a great job? Are you able to take time for yourself? If so, how often? Do you feel guilty when you do? What are some other “finger foods” you found went over well with your little one?